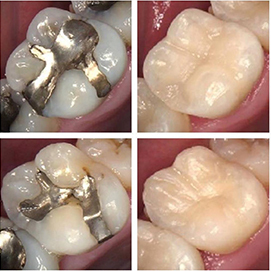 Amalgam fillings are silver in colour and are normally placed in teeth at the back of the mouth. Amalgam fillings have in the past lasted longer than composite fillings, however the technology used in white fillings has improved enormously in recent years. As such at South Dublin Dental 95% of the fillings we place are the more aesthetic white composite fillings.